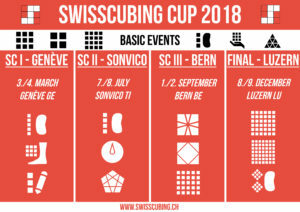 The Swisscubing Cup 2018 consists of four competition all around Switzerland. During the course of the Swisscubing Cup 2018, each WCA-Event will be hold at least once. The competitors placements will be summarized in a point-system and this results in the Swisscubing Cup 2018 ranking.